I’m about to make a big commitment. I’m getting married in a few weeks. I have been curious about the thoughts and feelings that have been passing through my brain. If you’ve been reading this blog for a while, you know that I was previously in a 19 year-ish relationship. Was I less committed because there was no ceremony, no official New York State document with a seal and a fancy signature from a judge? I have contemplated this question quite a bit and am ready to say, no, I was not less committed. In an odd way, it was my commitment to her that allowed me to accept the loss and change. But there is something about taking vows, which are not exclusive to marriage of course, that FEELS different. In college, I signed an honor code and I took that very seriously. In Buddhism there are vows one can take, which I have not done; but, I have made vows to myself about the person I want to continue to be and strive to be. Does that sound corny? Perhaps it is; but, consider it like a personal mission statement or your own chosen guidelines to live your life by or way to create and state your own personal set of values. When I’m going through something difficult like experiencing all the change that the accident and splitting from my former partner brought, I fell back on those guidelines again and again and again. Sometimes it was simply asking myself, do I want to be that person who would behave that way or go down that certain path? Frequently the answer was “No, I don’t want to be that person.” This checking in calmed me and saved me from doing or saying things I would later regret. I have decided to create a personal document of these guidelines. The difference with creating a written down set of guidelines (vows? Promises to yourself? Values?) and just generally trying to follow the right path is that you have something concrete to go back to. You are claiming these values as your own and they become your measuring stick, the tool you use to keep on track. Plus, it becomes something you hold yourself to not for other people; but, for yourself, which in the end benefits all of the people in your life. An added benefit is that by following your own guidelines, you reduce stress by reducing the amount of drama you create in your life and you become the person you wish to become. This is a project that encompasses personal and professional. It is a project that you will not be able to do in five minutes. It is a project you should think about, take notes, make lists of questions you can answer and make the time to undertake it fully. You could get a group of people together to undertake the same task, share ideas and get support or you could choose to do this as a solo project. Whatever you choose, I encourage you to turn off your gadgets and your TV and focus on the project because these are the statements that will define you. It’s sort of funny to think about my upcoming marriage as a commitment because I have already committed my best to Anya and to myself. On August 18th, I will publicly declare my vows to her, which are really vows to self. The most I can offer is to do the best that I can in each moment and all that that encompasses and to continue to look for ways to become more of the person I’d like to be. Make a commitment to yourself to live a life of integrity and bring your best self into your professional and personal worlds. Craft a short document you can return to as a reminder of what to do in tough situations. This commitment will serve you well and spill over into every little corner of your life. What kind of values do you want to uphold? What are the parameters of your ethical code? What kind of impact do you have on your workplace? Are you living the life you want? Do you take opportunities to understand yourself better so that you might grow in positive ways? I hope you enjoy the process. Let me know how it’s going! In the meantime, I have listed some resources I discovered that I will probably take a look at as I embark on this project. Ethics for the Real World by Ronald Howard and Clinton Korvar. Harvard Business School Press, 2004. Beyond Religion: Ethics for a Whole World. H. H. Dalai Lama. Houghton Mifflin Harcourt, 2011. 12 Steps to a Compassionate Life by Karen Armstrong. Knopf, 2010. Choosing Civility P.M. Forni. St. Martins Griffin, 2003. Civility Solution by P. M. Forni. St. Martins Griffin, 2009. Thinking Life by P. M. Forni. St. Martins Griffin, 2012. Creating Your Personal Mission Statement Fred Evers, University of Guelph, 2002. Note to Self: I forgive you. 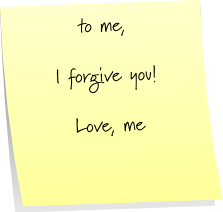 What would your day be like if you forgave yourself? There was recently a dust up about non librarian bloggers and the number of ARCs they were taking at ALA. I’m not really going to get into the nitty gritty; but, one post caught my attention. Go read that post and click to your heart’s content to get caught up on the issue if you are interested. For this post, all you need to understand is that a librarian who happens to write a blog I read regularly, tweeted something that upset people and that she most likely regretted. She apologized on her blog and then I’m guessing there was a pile up of chastising and shaming. We’ve all done, said, written, tweeted, and/or reacted in a way that we’ve sometimes instantly, sometimes later regretted. Take deep breaths. I mean it. Try to think calmly and rationally and deter any panic you feel. When you feel that you can make a calm and rational statement, apologize without excuse. Just apologize sincerely. Have a friend look it over if you want it double checked before you send it. Now is when the fun begins because humans love to pile on in a big shaming scrum. It won’t matter that you apologized. Especially in the digital world, folks will weigh in on why you are mean, stupid, insensitive, wrong or a horrible person. If you can, try not to read and respond to any of it. If you have a trusted friend/colleague have them review the responses in case there is one that is insightful or worthy of response. Some folks would think because perhaps you ignited the fire, you should stand in the flames. I don’t agree with this at all, especially when there is little value coming from the response. I think it is a completely legitimate and reasonable choice not to read it. Next: forgive yourself. If you are spending energy going over and over and over in your head what is happening and feeling shame and regret, you really need to forgive yourself. You need to have empathy and compassion for yourself and accept that you did it, reflect on how you would handle it differently next time and move on. MOVE ON! One technique for this “letting go” is to mentally label. When ever you feel tempted to read the flame war or your mind starts fueling the shame, create a label you can say in your head that will trigger you to move on to thinking about something else. You could follow up your label with a question: what would I tell my friend if she were in this situation? Whenever I suspect I’m judging myself too harshly, I always wonder what I would think if it happened to someone else. I catch myself having more compassion for others. I would never subject others to some of the judgey thoughts I think about my own behavior. I think Jenica Rogers, author of the post in question, handled this quite nicely. She apologized, took some heat and then wrote a post officially ending her participation in the discussion. This second post is an excellent idea and her example is a good reminder that you are in control of how long you participate in the discussion. And on the flip side, remember this: People do things, say things, write things that they regret. Let them apologize and refrain from shaming. Shaming is the modern day stoning. It is hurtful and divisive to all parties involved. Participate in discussions that create and build connection, inspire ideas and heal wounds. I guarantee that you will find more joy in life and work.